These videos contain the same content as the live workshops, but at your own pace in your own space. GLASS ON MIRROR: COLOR, TEXTURE, BLING! I travel! Contact me to book in your area. All my workshops are geared to engage and challenge students at any level of mosaic proficiency. No prerequisites required. Four full days of local sites, local talent, local materials (Bedrock glass! ), and creative immersion in a spacious, bright, comfortable, 5-bedroom Airbnb. Come for just the workshop or add lodging so you can roll out of bed and into the studio each morning and work late into the night on your project(s). Strong, effective art hangs on a backbone of good design. In mosaic we put the backbone in place, then support and flesh it out with eloquent materials. Meghan Walsh and Kelley Knickerbocker have teamed up with WDC’s District Clay Center to offer a four-day intensive course in abstract mosaic design and construction using the surprisingly eloquent rudiments and remainders of the ceramic making process (glaze testers, kiln cones, seconds, scraps, etc.). Meghan’s wealth of architectural design experience and Kelley’s intuitive design approach will demystify the process of abstract design and give students practical and repeatable design strategies for developing their ideas. Meghan and Kelley also bring their mad Material Whisperer skillz to assisting students with interpreting language and rhythm from the wide array of amazing miscellany generated by District Clay. Materials will be identified by their District Clay makers, and the makers will receive photos of the finished works made from their materials. This workshop kicks off with the opening reception for an exhibition of Meghan and Kelley’s work at District Clay’s gallery, one area of which will be reserved for the finished works from this course!. Includes four days of instruction, all materials, substrates/hanging hardware, supplies (mortar, tints, cups, rags, etc. ), return shipment of artworks to students, guest lecture(s) and possible field trip(s), inclusion of finished works in DC Clay exhibition, photographs of finished works to DC Clay makers, and opening reception for Walsh/Knickerbocker exhibition. If you’ve been looking for a concentrated opportunity to advance your understanding of abstract mosaic design/construction using unique materials and adventurous techniques, this is the workshop for you. You’ll have time to design/build at least one if not more abstract mosaic(s) start to finish, with an inspiring array of materials at your disposal (special concentration on the one-of-a-kind recycled glass of Bedrock Industries - get a taste in the photo at left - but also other glass, ceramic, crockery, stone, porcelain, wire, epoxy putty, and more!). We’ll start with an intro to abstract design principles, cut/prep your substrate, choose your material palette, process your materials, then build the mofo directly into pigmented mortars, maximizing height differentials. 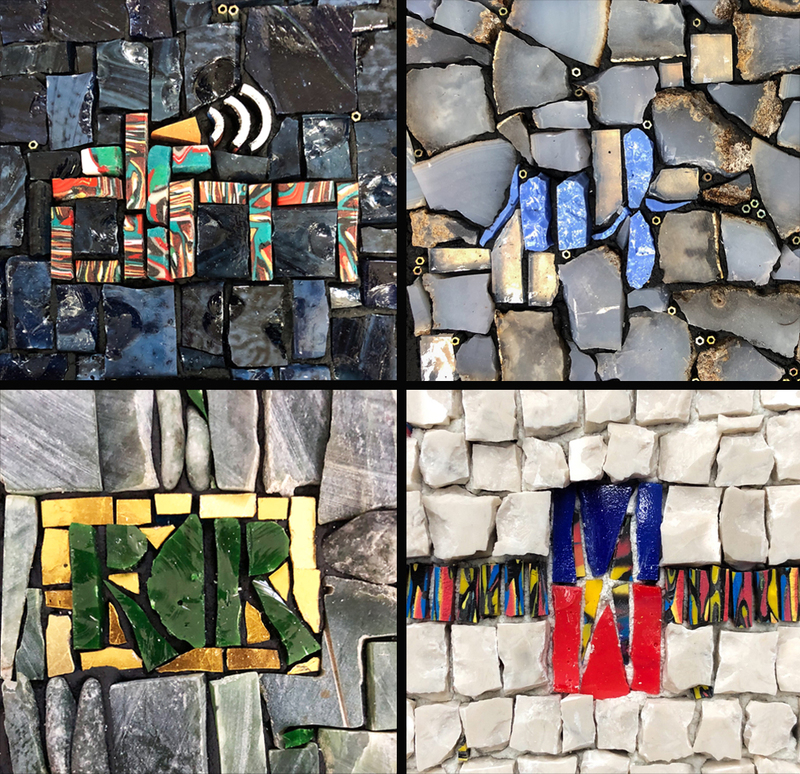 I’ll work one-on-one with each student on the way, and we’ll get an extra dose of inspiration with a show/tell visit by Seattle abstract mosaic artist extraordinaire Kate Jessup. Instruction will be via slide show, handouts, demos, discussion, exercises, hands-on building, one-on-one guidance, and critique. Curious about or frustrated with cement mortar as a mosaic adhesive? In this workshop you’ll learn to effectively mix, apply (bed, backbutter, and baggie methods), and maneuver cement to create substrates and strongly hold tesserae of varying heights so that grout isn’t needed. You’ll also learn to think of mortar as a design element, and even as a tessera! As you build a mosaic directly into cement mortar you’ll get a wealth of tips on working cleanly, tinting cement, creating sculptural and undulating effects, and smoothing/texturizing open areas of cement within or around a mosaic design. Contact me at kelley@rivenworks.com to book in your area. In this fun, information-packed workshop you'll learn and apply principles of shape, value, contrast and readability to the making of several small mosaics that capture your personality and style. You'll design your own signature block or logo as well as several other related motifs, and will gain an understanding of how motifs can enliven and unite mosaic design and composition. In addition, learn how you can invent a unique andamento with the motifs you design! Instruction will be via slide show, handouts, demos, discussion, exercises, hands-on building, one-on-one guidance, and critique. Students will gain understanding and proficiency by discussing and then drawing each andamento and creating a 6” x 6” paper (one-day) or hard material (two-day) mosaic in their choice of one of the given andamenti. Additional topics discussed: choosing an appropriate field andamenti for a mosaic, fun with interstices, and adapting/inventing/customizing andamenti. There are many approaches to incorporating open space into mosaic design. Through slides, demos, and discussion, this workshop introduces you to at least six of them. For hands-on practice, you’ll choose an approach and execute at least one space-centric mosaic. Objective 2: To develop an idea over three artworks. How we’ll get there: You’ll select one of many simple abstract designs provided (or quickly develop your own), map your plan of action out on paper, then execute that design in three different mosaic treatments (changing the andamento, the materials, the colors, etc.). In this process you’ll learn to free yourself up, trust your instincts (and the process), stop overthinking choices (keep moving forward), develop a narrative, avoid the paralysis of too many ideas/materials (set some constraints), and how make one material look like several. You’ll learn design and composition tips that will make your work more interesting and cohesive, and watch your design sense and technique develop and refine. And of course along the way you’ll be actively learning about cutting, setting, and using mortar as both an adhesive and a design element. Picassiette* is the process of transforming crockery and found objects into mosaic. What makes crockery so tempting and ideal for mosaic is not only its availability, ease of cutting, and varied glazes, but its unique curvatures, bumps and protrusions that translate to gorgeous dimensionality in tesserae. In this technique-rich, hands-on workshop, Kelley ramps picassiette up an innovative notch with her unusual methods of cutting/setting not only the flat surfaces of plates and other ceramic ware, but the lips, feet, rims, handles, lids, spouts, and more, including the exposing/tinting of the inner clay body. Students will learn cutting tools and techniques; setting in mortar to maximize sculptural/dimensional possibilities; building a cohesive color/material palette, and composing with crockery’s challenging curves and bumps. *Thought to be derived from the French slang “piquer” (to steal) + “assiette” (plate).
" I just finished one of Kelley's classes. Not only was it fun, but it was fast paced, centered on learning new skills and incredibly inspirational. I could look at her work all day. She has opened my eyes to a whole new relationship with materials." "I really enjoyed the class, and I appreciate how much time you obviously put into preparing for it. I also appreciate your generosity in sharing your knowledge. I thought my head might explode from all the info! I was a little concerned that I wouldn't remember much, but then I saw what a great job you did of recapping in your handouts." "The workshop was excellent! My head is about to burst with ideas how to use all the techniques I learned." Hosted in a spacious, bright, comfortable, 5-bedroom Seattle Airbnb. Gila Rayberg arrived at the visual arts after a successful career as a freelance musician and educator. Allowing her strong sense of intuition and love of experimentation to guide her, Gila has developed a unique voice in the realm of mosaic portraiture. Gila exhibits regularly throughout the United States and has won numerous awards for her uniquely expressive portraits. In the summer of 2018, Gila was one of nine artists, from seven countries, invited to participate in the 3rd Contemporary Mosaic Art Symposium in Ploaghe Sardinia, under the direction of Maestro Giulio Menossi. Gila travels extensively throughout the US and internationally giving workshops and sharing her passion for mosaic portraiture. Her artwork has been published in numerous art books and is collected worldwide. In this 3-day class, students will work on a 14” x 11” portrait (human or animal) of their choice (Gila will provide detailed instructions in advance on selecting an appropriate portrait reference). Gila will share her extensive knowledge about creating mosaic portraits, with an emphasis on picassiette: cutting, shaping & incorporating dishes and pottery into mosaics. She will demonstrate how to use hand tools to cut & shape picassiette materials, and will give tips on using these materials to add texture & interest to mosaic portraits. Each participant will receive individual attention & guidance from Gila while working on their portrait. Students are not expected to finish their portrait in the 3-day workshop. Gila will discuss a plan with each student on how to complete their unfinished works at home. Substrates and a selection of crockery will be provided, but students are encouraged to bring unique finds (dishes, pottery, teacups, etc) to personalize their works. Thrift stores & yard sales finds are perfect, as are those chipped, cracked, and broken bits that you can’t bear to throw away and would love to incorporate into your art! Bringing extra to share ensures that there will be unique and surprising selections for all. This workshop is designed to interest and challenge mosaic makers of any skill level. Participants will leave the workshop with a good understanding of choosing a subject, transferring a design to a substrate, understanding value, laying materials of varied thicknesses, creating likeness, and much more. Limited capacity, so book now! 50% down holds your spot; balance due by 01 July.